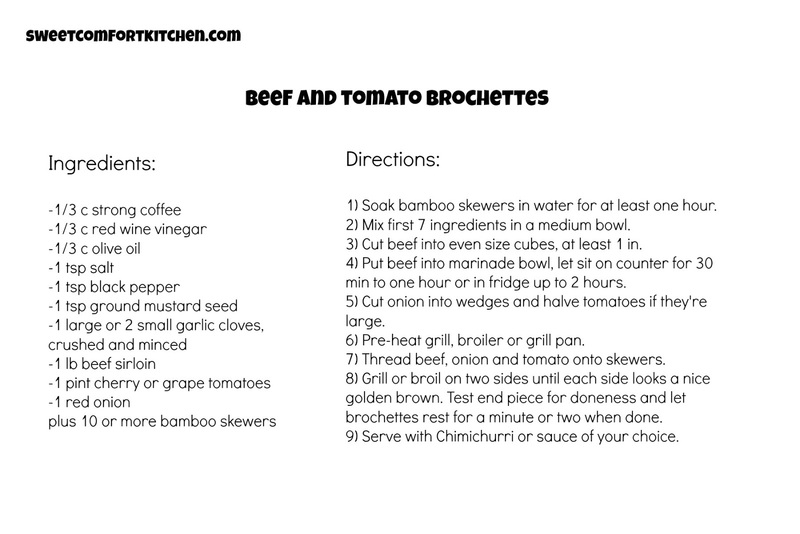 Brochettes? Kabobs? Kebabs? Skewers? Whatever you call them, they're a great summer party food. 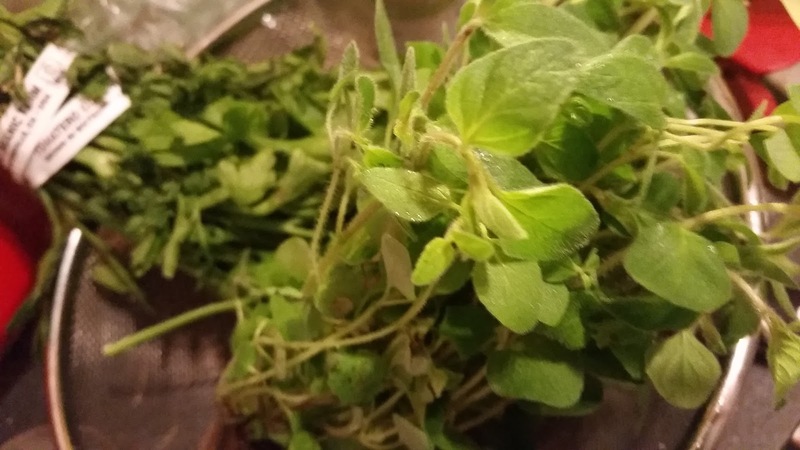 Add a chimichurri sauce made with fresh herbs, and they become something magical. 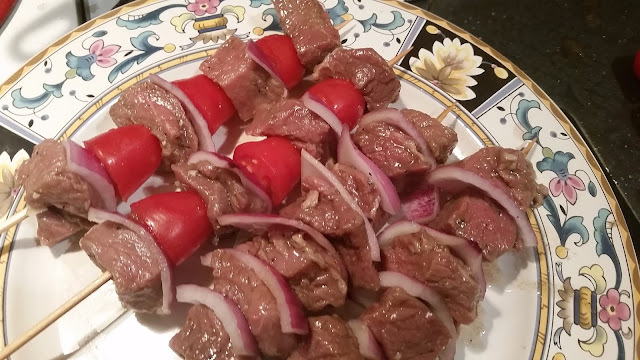 Beef kabobs were one of my favorite grilled summer foods when I was growing up. 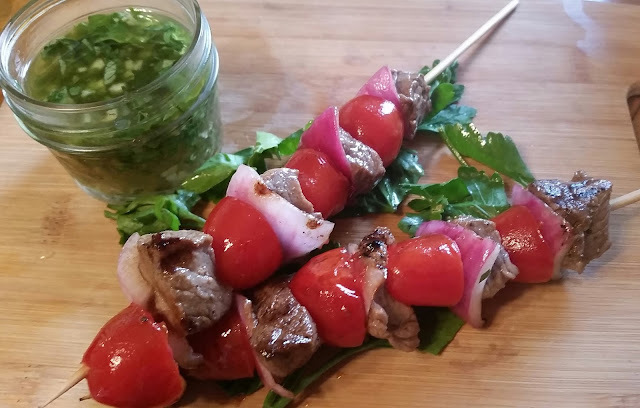 I also love just plain veggie skewers, and those would also be great with the chimichurri. Mostly I like the meat and veggies together. These are halved grape tomatoes, but zucchini or mushrooms also work well. First, though, the Chimichurri. Make it at least one hour ahead, preferably one day in advance, so the flavors have time to come together. 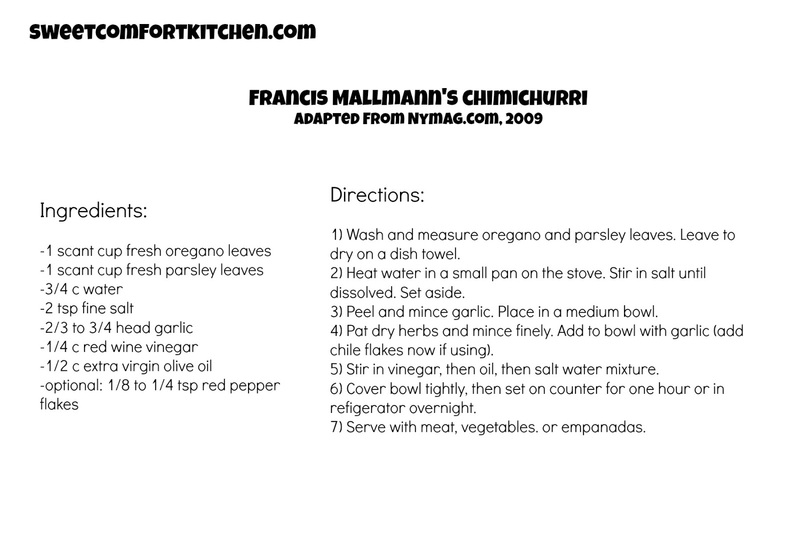 Chimichurri is an Argentine sauce, but somehow in my year of study in Argentina, living with three different families there, it never made it onto my radar. They happened to be families that didn't serve that with their asado (grilled meats, an important part of the Argentine diet). It seems to be all over the place in the U.S. these days, but to make it myself I decided to turn to Francis Mallmann, a famed Argentine chef featured in the Chef's Table series on Netflix. The original recipe is from NY Magazine here. Wash 1 cup each parsley and oregano leaves, (they can be scant cups, you don't have to pack them) removing the stems before measuring, and set on a dishtowel to dry for a few minutes. Put 3/4 cup water and 2 tsp fine salt in a small pan and heat until the salt is dissolved, stirring a bit. Set aside. Peel and finely mince about 2/3 to 3/4 of a head of garlic - you can take the smell off your fingers with some lemon juice when you're done. 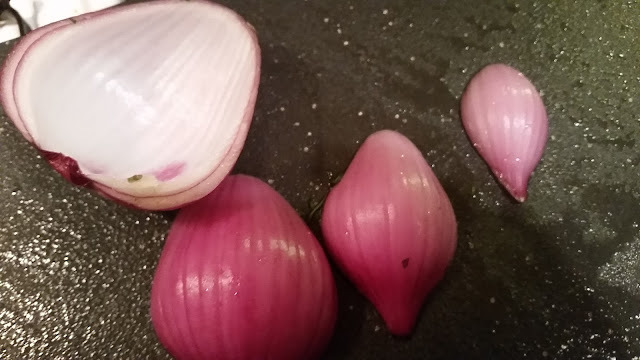 Set the garlic in a medium bowl. I could have minced more finely, but it was getting kinda late! 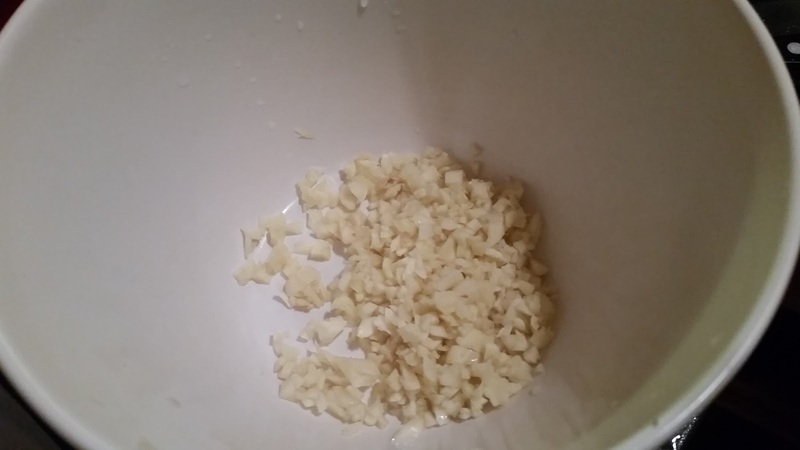 A garlic press would be perfectly fine to speed up the process. Finely mince the oregano and parsley and add it to the bowl of garlic. Stir in 1/4 c red wine vinegar and 1/2 c olive oil. Whisk in the water-salt mixture, stirring well, cover the bowl tightly and set in the fridge for at least an hour, preferably a day. It'll keep for about three days. 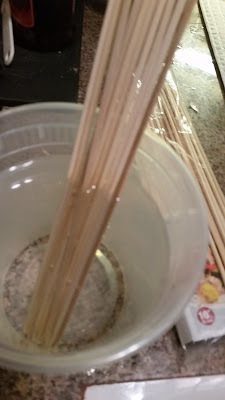 And now, the meat...if you're using bamboo skewers, don't forget to soak them in water for an hour before grilling! This is less important if you're using a grill pan on the stove like I am, but still, don't catch your food on fire, please. If soaking this way, turn them upside down to get both ends wet. 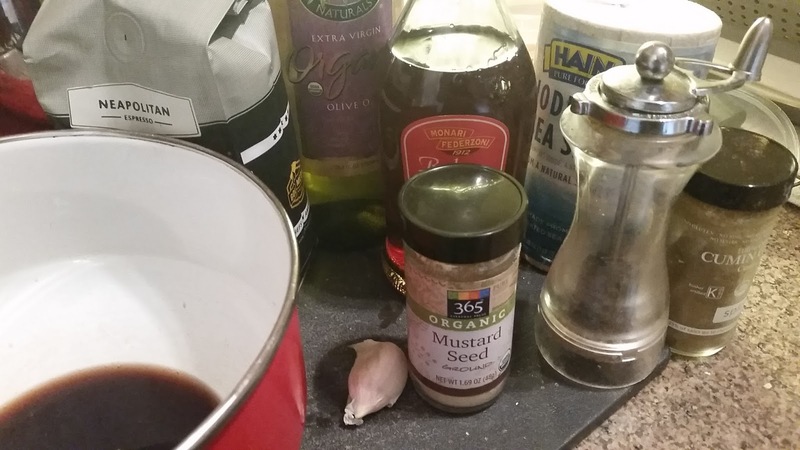 Mix the marinade in a medium-large bowl: 1/3 cup each red wine vinegar, olive oil, and strong brewed coffee, 1 tsp each ground mustard, salt, and pepper, and 1 large or 2 small cloves garlic. Cut 1 to 1.5 pounds beef (something tender is good, like tenderloin or sirloin) into even sized cubes and put in the marinade for 30 minutes to an hour. You can leave it at room temp for that long, but if it'll be longer, put it in the fridge. While the meat marinates, prepare the other veggies. Cut them to the same size as the meat if possible--leave small cherry tomatoes whole, or halve them if you cut the meat very small. If you use an onion, cut it in half and pull out one or two layers together before cutting into chunks. That way you can cut the chunks more evenly. 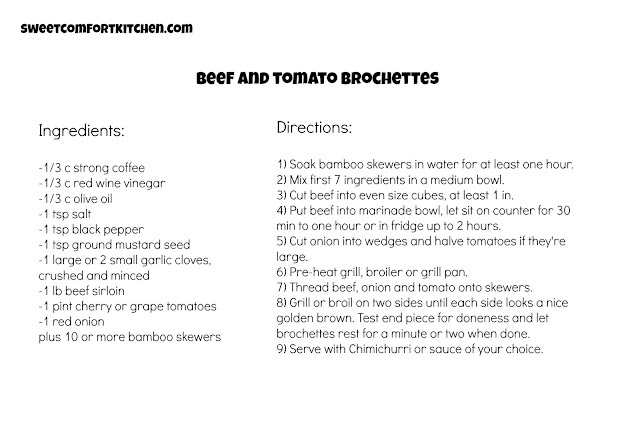 Now, assemble the brochettes. 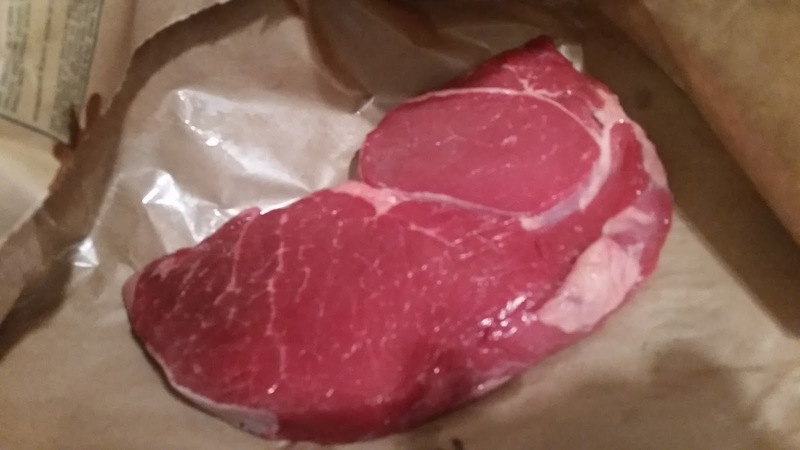 Thread on a piece of meat, a slice of onion, and a piece of veg, then repeat. Or make some that are all meat, or all veg, however you like it. Heat up the grill or a grill pan while you do this, nice and hot so you get pretty grill marks on the outside. Cook, turning once halfway through, until you see nicely dark brown spots on the outside. Start testing for doneness with a couple of end pieces and put them back on if need be. it could be just 2 min per side, or 5 or 6 per side or more depending on your fire and the size of the pieces. Enjoy with the Chimichurri and your favorite summer libation! Hi everyone - I just realized I haven't posted at all this month. Life has been so crazy that I haven't even had the energy to be creative. End of semester testing and paperwork, numerous visits to the vet's office, oh, and there was the strike. I've been eating as well as I can through it all and finding that the change in what I'm eating is helping me feel better than I'd have thought. I'm taking some time off this summer, so I should be able to think of some really fun stuff to share. 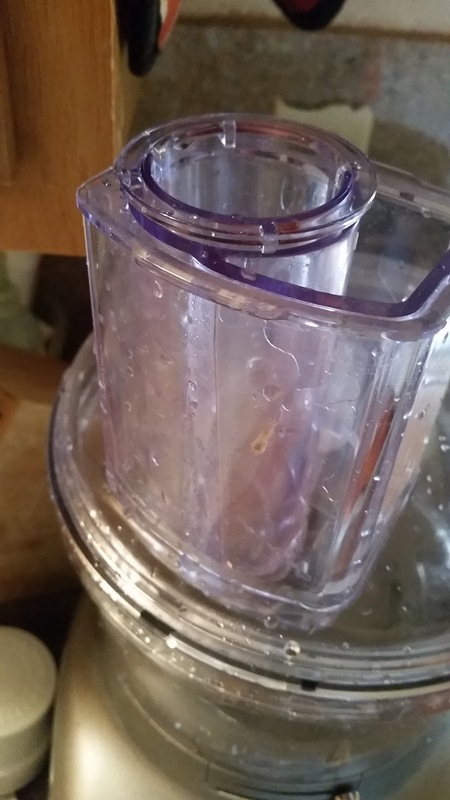 Of course, in the midst of all the madness of the last couple of months, my trusty food processor went kaput (RIP). 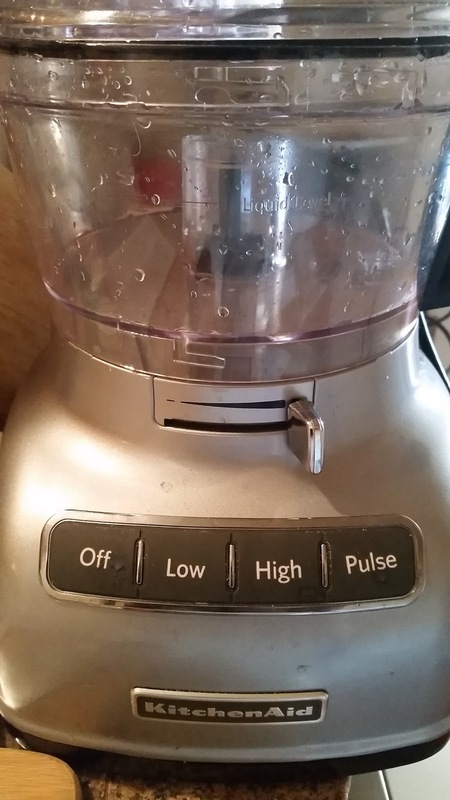 The motor was fine, but that little plastic thingy on the lid that locks it broke off. Wah! I got a new one and I'm really happy with the one I chose, as it also acts as a mandolin slicer, slicing evenly with adjustable thickness. 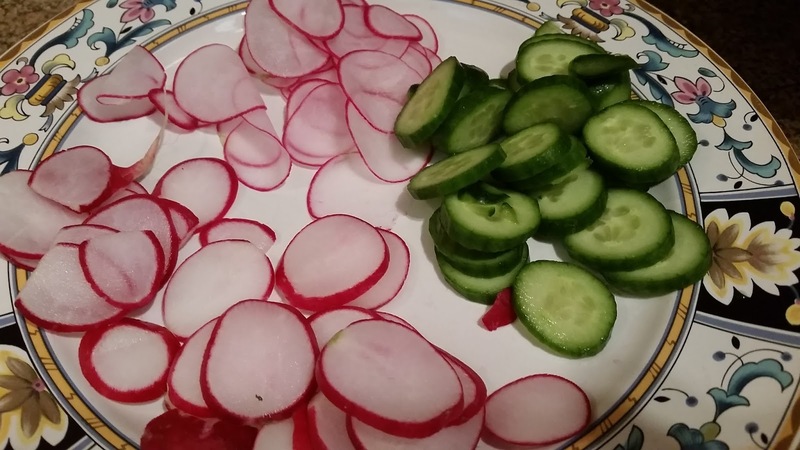 Check out the three thicknesses of radishes (thinnest setting and next two) and the cucumber (thickest setting). I wanted to keep slicing and test all the settings at once, but a girl can only eat so many radishes on one bowl of black beans. I love the paper-thin look of the radish at the top, and I don't have to worry about slicing off my fingertips with the mandolin! The top of the processor has a feeding tube with two options, a small tube for skinny things and the standard feeding tube for wider things like whole blocks of cheese, which I haven't tried yet. You adjust the thickness with a sliding lever that lowers or raises the blade. Pretty nifty, no? That's all for today - see you after the end of the semester!